Retired North Delta art teacher Dave Stevens will be launching his children’s book at the George Mackie Library on Oct. 15. Dave Stevens sits in his studio surrounded by the whimsical creatures he created for his debut book Weirdly Wonderful A to Z during the North Delta Studio Stomp on Oct. 1. Thanks to the support of his family and community, a local artist is getting ready to add ‘writer’ to his resumé. Dave Stevens, who taught art at North Delta Secondary for 30 years before retiring in 2012, is set to release his debut children’s book Weirdly Wonderful A to Z with a launch event this weekend at the George Mackie Library. 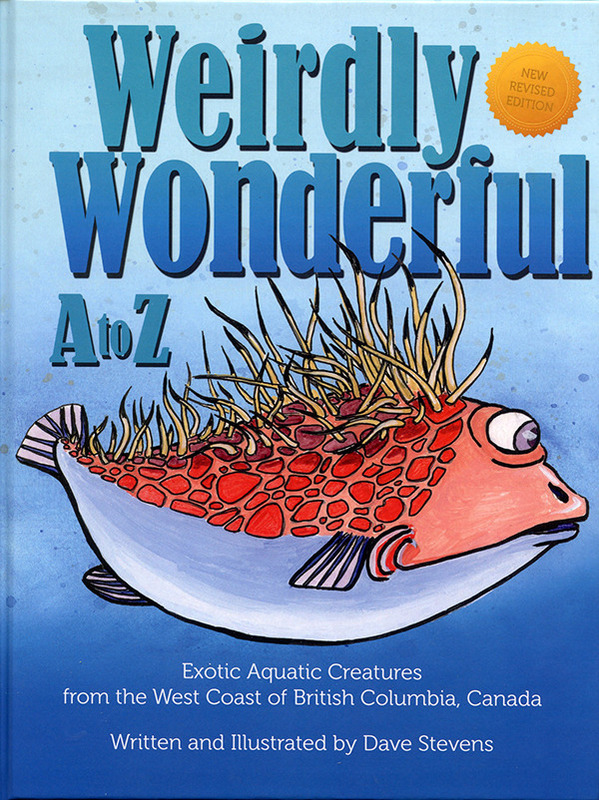 Weirdly Wonderful is an alphabet book that uses Stevens’ own illustrations to showcase sea creatures found exclusively in B.C. as seen through an imaginative childlike lens. “What I wanted to do was take aquatic creatures from British Columbia and try and picture them how somebody who hasn’t seen what they look like initially might start to picture them in their imagination,” Stevens said. Inspired by his work as a storyteller for his own children, Stevens crafted his art around the literal names of the creatures he picked for his book, placing the head of an elephant on a seal and adding a peanut butter and jelly sandwich next to a jellyfish. More than just a collection of fanciful drawings, Weirdly Wonderful is also educational, as Stevens drew realistic depictions of the creatures at the bottom of each page along with its common name, its Latin name, and some fun facts. In fact, Stevens found that the biggest challenge in putting the book together came from arranging all the illustrations and information about the creatures he wanted to share with his audience on each page. One of the strongest forces behind this project was Stevens’ wife Diane, an English teacher and unpublished author, who helped proofread his work and pushed him to complete the book. “She’s got a very extensive background in the whole writing process… and she was really challenging me to change my mindset, because once the book is out, it’s out,” he said. Stevens found out the hard way what a slow grind getting a book published can be, taking time to pitch his creation to publishers, only to wait months before getting a negative response. Eventually, he decided to publish the book himself. Stevens has already begun work on his next book, a similar alphabet-based collection of information and illustrations about animals, except this time he’s setting his focus on the skies with birds and flying insects. Stevens will be at the George Mackie Library (8440 112 St., Delta) from 1:30 p.m. to 3:00 p.m. on Oct. 15. Copies of Weirdly Wonderful A to Z will be available for purchase and signing by the author-illustrator. All ages are welcome.